Langley artist and new member of the Fort Langley Artists Group, Pat Weibelzahl, holds one of her recent acrylic paintings, which she plans to hang at the Flagstop Gallery during FLAG’s first show of the season. Micro/Macro opens May 3 and continues until June 15 at the gallery inside the heritage CN train station on Mavis Avenue. 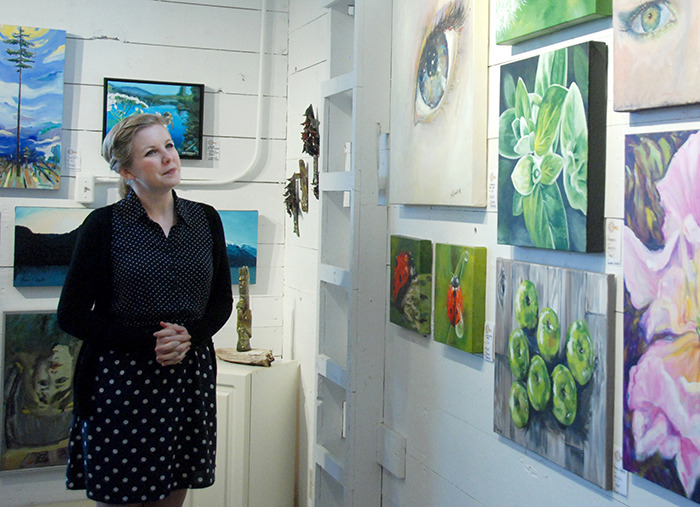 The gallery will be open on Saturdays, Sundays and holiday Mondays from noon to 4 p.m. until September.— image credit: Brenda ANDERSON/Langley Times Fort Langley Artist Group is back for the 2014 season and beginning this weekend, the artists are trying a new theme on for size. The first show of the year, titled Micro/Macro opens at the Flagstop Gallery in the Langley Heritage Society CN train station on May 3, from noon to 4 p.m. It promises to be a busy summer for FLAG’s 18 member artists. The show, which continues until June 15, will be the first of three exhibits that will run over the course of the season. Taking part will be three new artists who joined the group this year — Wendy Neilson, Pat Weibelzahl and Angela Weichel. Weibelzahl was actually a member of FLAG once before — for about a year, two decades ago. t the time, she owned a silk painting business in Fort Langley. In her 30s, Weibelzahl studied fine art at what was then Kwantlen College. But even then, she emerged with the idea that she really should find a steady, paying job. “I’ve danced between creativity and practicality my whole life,” she said. “But I’m a creative person, and I have to express that.” And so the artist is ready to allow her creative side to take over. In addition to re-joining FLAG about a month ago, she has also been painting each week with South Langley artist Susan Falk. Falk’s advice to Weibelzahl — get painting. In order to truly become an artist, you have to paint a hundred paintings, Falk told Weibelzahl. 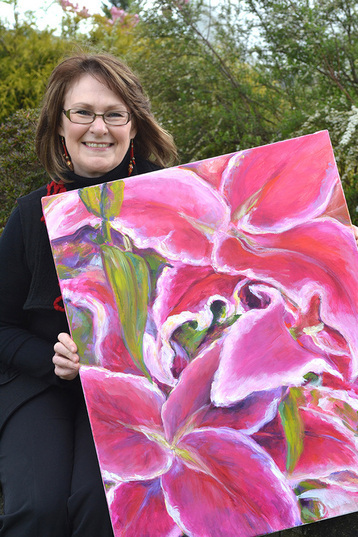 Creating everything from bold florals to colourful impressionist images of boats, Weibelzahl has been putting brush to canvas and creating a number of pieces to hang in Micro/Macro, including a larger-than-life image of pink lillies. One of the things Weibelzahl enjoys most about the group is being surround by so many creative people. FLAG’s 18 members meet monthly to offer each other advice and feedback in a friendly, non-competitive environment. “I’m happy to have the opportunity to show my work in the community,” she said. 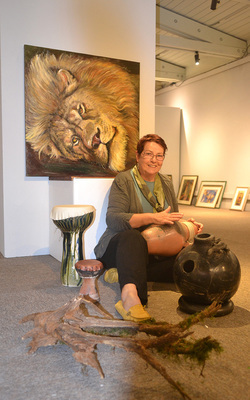 Gail Simpson demonstrates how to play an Udu drum which she sculpted from clay.— image credit: Brenda ANDERSON/Langley Times Past and present will meet when Passages and Reflections: A Unifying Retrospective of FLAG — 1993 to 2013, opens at the Langley Centennial Museum this week. Fort Langley Artists Group’s 20th anniversary show begins on Thursday, Sept. 19 and continues until Nov. 3 at the museum on King Street in Fort Langley. Throughout each summer for the past two decades FLAG artists have mounted shows based on themes suggested and selected by members. Passages and Reflections offered the artists a chance to revisit any and all themes from the past 20 years. “We wanted to address the themes (in the retrospective) because that’s what draws us together — the democratic process of choosing a theme,” said FLAG artist Robin Bandenieks. At the beginning of each FLAG season, every artist arrives with an idea. They lobby, they debate and they vote.And once the choice is made, there is no getting out of it, regardless of how impossible it may seem. In fact, it becomes a case of ‘how creative can you get?’ said Bandenieks. Over the years, members have been challenged to represent both concrete themes — Doors, Dancers, Wood and Stone — and some that were slightly harder to pin down — Almost Functional, The Sound of Art, and Extraordinary Ordinary, among them. Often, said Bandenieks, it’s the sculptors who face the greatest challenge in adhering to a theme. “Rivers of the Valley — how are you (as a sculptor) going to do that?” she laughed. This time, however, each artist was encouraged to revisit a theme that truly inspired them, from Farms of the Valley to Bon Appetite, to The Shoe Show. All of FLAG’s 19 current members are participating in the 20th anniversary show, alongside four founding members — Barbara Boldt, Linda Muttitt, Doug Bluwer and Ron Bryson — who accepted the group’s invitation to rejoin them, if only for a couple of months. Collectively, participants have drawn on no fewer than 22 different themes. With several days to go until the large, multi-artist exhibit was scheduled to open, museum curator Kobi Christian, helped out by five of the artists, was busily paring down the large number of submissions — selecting enough to fill the gallery space without overwhelming it and doing their best to ensure that it flowed well from one artist’s space to the next. FLAG anniversary shows at the museum are something of a tradition, said Bandenieks. Every five years, the artists — who display their work each summer at the modest CN heritage train station gallery just down the road — take over the substantially larger museum space in celebration. For Passages and Reflections, the gallery has been divided into segments, giving each artist a designated space to display. With the painters occupying the walls, sculptors — including Gail Simpson — have arranged their pieces on plexiglass blocks throughout the room. Simpson’s stands hold a series of Udu drums — which are shaped like clay jugs with a hole in the side for added percussive effect — and somewhat more traditional looking goblet drums. The latter are shaped, as the name would suggest, like a large chalice, with a skin pulled tightly over the top. “Udu drums are traditionally from Africa — this is the West Coast version,” explained the artist, who not only creates the drums, but plays them, too, and is happy to sit cross legged on the floor to offer a quick demonstration of proper Udu technique. One of the exceptions to the painter/wall-sculptor/stand rule is Julie Bourne. The Langley sculptor rolls out her clay into slabs, which she then carves and moulds into three-dimensional wall art. Bourne who will display her trademark raku pieces has, not surprisingly, reserved two thirds of her display space for equine art. “I can’t seem to stop doing horses lately,” said the artist, who hand crafted a pair of facing “war horse” heads, inspired by the TV series Game of Thrones, from rolled clay. One is finished in a dark grey that does a convincing imitation of metal, while the other shimmers with a pale pearlescent finish. At the far end of the room, Margo Harrison, the group’s only current and founding member, has brought a pair of her well known ‘Comfort Cat’ sculptures for display. But she also hauled out her brushes for this exhibit and looked all the way back to 1994 for her inspiration. When Harrison heard that the show would be a retrospective of former themes, she was thrilled. “I thought, ‘Oh, goody, I’m going to revisit the Hands theme,’” she said. “I just had a wonderful time revisiting the themes. “I was stoked. It gives you energy,” Harrison said. This time, she approached it in acrylics instead of watercolours. Old and new paintings from 1994 and 2013 will hang, side by side, in her corner. “Just to be confusing,” she laughed. The artists will host an opening reception on Sept. 19, from 7 p.m. to 9 p.m. at the museum. Entertainment will be provided by harpist Maria Moularas. The Langley Centennial Museum is located at 9135 King St. It is open daily from 10 a.m. to 4:45 p.m. except on Sundays, when it is open from 1 p.m. to 4:45 p.m. For more information, call the museum at 604-532-3536.